(c) Western blot analyses of p-Akt (Ser473) and p-S6RP (Ser235 and Ser236) in two RCT-E565 transplanted tumors treated with vehicle or PF02341066. Samples were isolated 4 h after the last dose from mice treated with PF02341066 for 3 d. (d) Responses of RCT-E565 transplanted tumors in athymic mice to PF02341066 or vehicle. Data are means ±s.e.m. (each group, n = 6). *P < 0.005, **P < 0.001 (Student,s t test). Cabozantinib (XL184, BMS-907351) is a potent VEGFR2 inhibitor with IC50 of 0.035 nM and also inhibits c-Met, Ret, Kit, Flt-1/3/4, Tie2, and AXL with IC50 of 1.3 nM, 4 nM, 4.6 nM, 12 nM/11.3 nM/6 nM, 14.3 nM and 7 nM in cell-free assays, respectively. Level of phospho-proteins in RTK and PI3K/Akt/mTOR pathways in treated tumors, detected with western blot. (c) Phospho-Erk and phospho-S6 intensity in MDSCs when co-transfected with ERK2 and p70S6K, detected with western blot. A, representative Western blot analyses of samples obtained from NSCLC cells exposed to 1 umol/L erlotinib or PHA-665,752 for 6 hours. Levels of total and phosphorylated forms of EGFR, MET, and HER3. B, representative Western blot analyses of samples obtained as described in A showing the levels of EGFR downstream signaling mediators. Protein samples obtained from untreated and treated cells were separated by SDS-PAGE and immunoblotted with each antibody. Tubulin served to ensure equal loading. Inhibition of c-MET sensitizes PTEN deficient tumor cells to EGFR TKI-induced apoptosis. 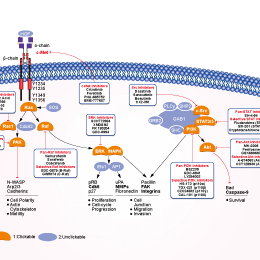 PTEN deficient TGFα-EGFRWT;InkΔ2/3-/-;PTENlox GBM tumor cells were treated with gefitinib (10 uM) and/or the c-MET kinase inhibitor SU11274 (10 uM). Immunoblot analysis of total cell lysates from TGFα-EGFRWT;InkΔ2/3-/-;PTENlox GBM tumor cells treated with the indicated inhibitors using c-MET and c-MET phosphotyrosine 1234,1235 antibodies. Anti β-tubulin probing is used as an internal loading control. Pulsatilla saponin D, isolated from the root of Pulsatilla koreana, targets c-Met and exerts antiangiogenic and antitumor activities. SGX-523 is a selective Met inhibitor with IC50 of 4 nM, no activity to BRAFV599E, c-Raf, Abl and p38α. Phase 1. JNJ-38877605 is an ATP-competitive inhibitor of c-Met with IC50 of 4 nM, 600-fold selective for c-Met than 200 other tyrosine and serine-threonine kinases. Phase 1. Inducers of EMT. (A) Expression of Hgf, Egf, and Tgfb1 genes in RETAAD tumors analyzed by qRT-PCR. Hgf and Tgfb1 are preferentially expressed in PMN-MDSC, while Egf is preferentially expressed in tumor cells. Data are from four individual experiments using sorted fractions of PMNMDSC and melanoma cells. Bars represent mean 6 SD. (B) NBT-II cells (100 cells per well) were plated for 4 d to allow for colony growth and were pretreated for 24 h with inhibitors before the addition of PMN-MDSC. After co-culture with PMN-MDSCs in the presence of inhibitors, cells were fixed and stained with anti-rat desmoplakin. Green, Desmoplakin; red, H2b (nuclear stain). PD153035-EGFR inhibitor, JNJ38877605-c-met (HGFR) inhibitor, and SB525334-TGF-bR1 inhibitor. Images are representative of three independent experiments. (A) p-MET, p-eIF4E, and p-ERK1/2 levels in S462 cells 24 hours after treatment with 1 μM PF04217903 and 750 nM PD901. (B) Change in cell number after treatment with 1 μM PF04217903 (PF903) and/or 750 nM PD901. Graph represents the average log2 of fold change in cell number 72 hours after treatment relative to time 0 (mean ± SD, n = 3). MGCD-265 is a potent, multi-target and ATP-competitive inhibitor of c-Met and VEGFR1/2/3 with IC50 of 1 nM, 3 nM/3 nM/4 nM, respectively; also inhibits Ron and Tie2. Phase 1/2. c-MET/RON inhibitors restore sensitivity to lapatinib in SK-BR-3-LR cells. The concentration used was 0.1 uM for crizotinib, MGCD-265, XL880, sunitinib, dasatinib, TAE-684, and RON inhibitor I. Columns, means; bars, SEMs (n = 3). The phosphorylation of HER2, AKT and ERK1/2 was determined by Western blotting. Western blots of MET and Akt for parental, crizotinib-resistant, or capmatinib-resistant cells treated for 4 hours with a range of doses of capmatinib, crizotinib, or glesatinib (G-I). BMS-754807 is a potent and reversible inhibitor of IGF-1R/InsR with IC50 of 1.8 nM/1.7 nM in cell-free assays, less potent to Met, Aurora A/B, TrkA/B and Ron, and shows little activity to Flt3, Lck, MK2, PKA, PKC etc. Phase 2. BMS-794833 is a potent ATP competitive inhibitor of Met/VEGFR2 with IC50 of 1.7 nM/15 nM, also inhibits Ron, Axl and Flt3 with IC50 of <3 nM; a prodrug of BMS-817378. Phase 1. AMG 208 is a highly selective c-Met inhibitor with IC50 of 9 nM. Phase 1. MK-2461 is a potent, multi-targeted inhibitor for c-Met(WT/mutants) with IC50 of 0.4-2.5 nM, less potent to Ron, Flt1; 8- to 30-fold greater selectivity of c-Met targets versus FGFR1, FGFR2, FGFR3, PDGFRβ, KDR, Flt3, Flt4, TrkA, and TrkB. Phase 1/2. . Both V-H cells and V-J cells are treated with MK-2461, XL-184 or ABT-869, respectively. (i-k) Western blot analysis of sFlt-1 expression after incubation with three VEGF-A receptor inhibitors or in the control. Golvatinib (E7050) is a dual c-Met and VEGFR-2 inhibitor with IC50 of 14 nM and 16 nM, does not inhibit bFGF-stimulated HUVEC growth (up to 1000 nM). Phase 1/2. PC-9/LMC-GR cells (2 × 105 cells/well) were incubated in 6-well plates with various concentrations of gefitinib with or without crizotinib (1 μmol/L) or golvatinib (1 μmol/L) for 1 hour. Cell lysate were obtained and subjected to immunoblotting with antibodies toward the indicated molecules. AMG 458 is a potent c-Met inhibitor with Ki of 1.2 nM, ~350-fold selectivity for c-Met than VEGFR2 in cells. NVP-BVU972 is a selective and potent Met inhibitor with IC50 of 14 nM. LY2801653 is a type-II ATP competitive, slow-off inhibitor of MET tyrosine kinase with a dissociation constant (Ki) of 2 nM, a pharmacodynamic residence time (Koff) of 0.00132 min(-1) and t1/2 of 525 min. Norcantharidin is a synthetic anticancer compound which is a dual inhibitor for c-Met and EGFR in human colon cancers.